On a pleasant afternoon of cruising and exploration, the captain suddenly calls for everyone to “hold on” followed by a sharp veer to port. Guests get tossed to and fro, beverages slop, items slide and crash to the decks, unlatched cabinets and locker doors bounce and bang, and the formerly tidy boat is now in complete disarray. You have just cut into a passing vessel’s wake. Whether creating one or taking one on, being aware of the wake is important for boaters of all sizes. A boat wake is the area of recirculating water behind a vessel under power. Depending on hull design, speed, vessel weight, and power supply, the wake of a boat can produce anywhere from a minimal flow of water and rippling chop to swelling waves of significant size. Mid-range recreational vessels of 35-50 feet, for instance, can throw a series of consecutive wakes of 3 feet or more. 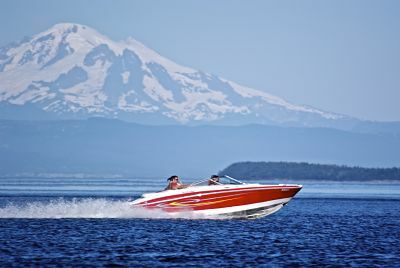 Additionally, novice powerboat captains often attempt to minimize the effects of their sizable wake too late, or too close, and still cause damage. Powered vessels throw a much larger wake as they slow down and are “stern in the water” than when they are on plane and situated horizontally. For optimum safety and courtesy, boats should already be at idle and flat on the water when passing. Handling responsibilities and subsequent hazards of managing wake are constantly present for all captains. Significant or constant wakes can cause serious damage to real and personal property. Docked vessels, shoreline habitation, waterfront property, vessels not under power (such as kayaks, canoes, sailing vessels, small fishing boats, moored or anchored), marine life, and swimmers are all affected by the sudden power and force of wakes. 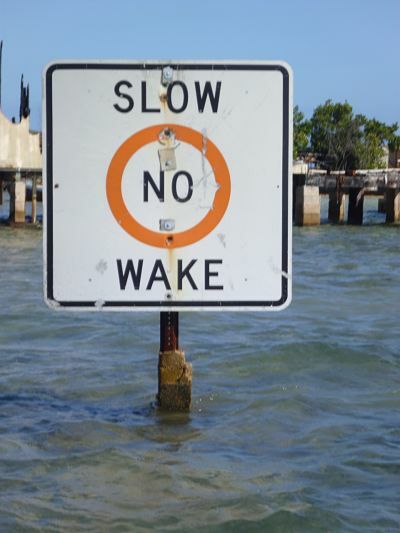 For these reasons, many areas have restricted or no-wake zones in tight channels, inter-coastal waterways, ports, marinas, and populated water communities. The commonly referred to “100-foot rule” is a good starting point in regards to navigating under idle within a hundred feet of the areas listed above, though some instances where heavy boating traffic, vessels in distress, and larger recreational gatherings (such as races) demand more caution and courtesy from skippers. Damage to shoreline nesting grounds and beds. Danger and potential harm to marine wildlife, especially slower-moving sea mammals such as manatee. Dock rash (damage to gel-coats, wood trim, and hulls) caused from rocking vessels slipped in docks rubbing against pilings and finger piers. Upturned personal items and equipment from vessels rolling in passing wakes. Swamping of smaller vessels with low gunwales such as fishing boats, kayaks, canoes, dinghies, and other low-sitting watersport vessels. Dangerous swimming and boarding conditions for downed skiers, tubers, and wake-boarders. Threat of crew/guest overboard situation due to high pitch rolling. Threat of falls and injuries on deck due to unstable vessel rolling caused by wakes. In narrow navigational channels, heavy boat traffic can contribute to building and lasting cross-chop. Property damage to waterfront homes along their seawall, decking, docks, and shored equipment. USCG guidelines for safe handling and responsible seamanship do apply for vessels operating outside of no-wake zones as well. 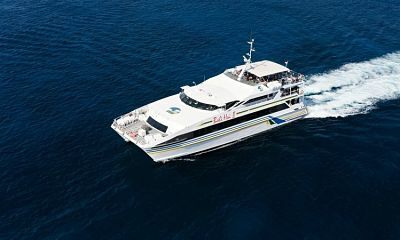 While vessels under 1600 GT are not specifically required to manage their speed in regards to wake, they are still required to operate in a prudent matter which does not endanger life, limb, or property (46 USC 2302). Nor do the Navigation Rules exonerate any vessel from the consequences of neglect (Rule 2), which, among other things, could be unsafe speeds (Rule 6), improper lookout (Rule 5), or completely ignoring your responsibilities as prescribed by the Navigation Rules. a) A person operating a vessel in a negligent manner or interfering with the safe operation of a vessel, so as to endanger the life, limb, or property of a person is liable to the United States Government for a civil penalty of not more than $5,000 in the case of a recreational vessel, or $25,000 in the case of any other vessel. (b) A person operating a vessel in a grossly negligent manner that endangers the life, limb, or property of a person commits a class A misdemeanor. (2) commits a class A misdemeanor. Although mostly at the mercy of being affected by another’s wake, there are a couple of things a Skipper can do to minimize potential damage. When sailing/motoring through wake, turn boat to 45 degrees relative to the direction of the wake. For a sailboat or other slow moving vessel, make sure you have enough power that you can maintain some amount of forward motion AFTER the wake has passed. If you are a fast moving boat, slow down enough that your boat does not slam down on the water, which can cause a loss of control or damage the hull. Keeping your boat on a dock “T-head” may be convenient, but usually you are adjacent to an active fairway with boats moving constantly, creating wake that will roll your boat to and fro. Try and get a berth inside the T head. When anchoring, fishing, or choosing your recreational ground for the day, note where most of the boat traffic, jet skis, water skiers, and large crowd anchorages are located. Then anchor as far away from the area, or traffic pattern, as you can. Being aware of the potential damage and danger a wake can cause others on water and adjacent land is the responsibility of every captain. Both local and national maritime rules and regulations help govern good conduct aboard recreational vessels. In addition, staying alert, courteous and having care for fellow water travelers helps keep water experiences enjoyable, safe, and fun for all.